Gammon is a flavorful cut of meat from the back legs of a pig. It is generally cured in the same way as bacon, giving it great flavor and making it an easy cut of meat to cook. There are many different variations on how to cook gammon, but keeping it simple preserves the flavor of the meat. Those who are looking for recipes on how to cook gammon will find a multitude of recipes, just like you would with a ham or ham steak. 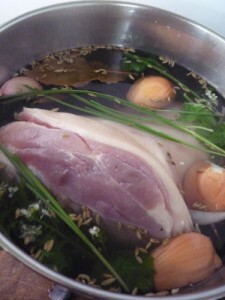 My favorite recipe for how to cook gammon is to boil the gammon in a mixture of orange juice and water (enough liquid to cover the meat), and boil for about 45 minutes per pound. You can also cut into inch-thick slices and fry the gammon until brown on either side as you would a ham steak . Serve with a glaze make of orange juice, honey, brown sugar, and mustard. It sets off the flavor of the gammon and it’s not only great, but it’s easy to prepare. And now, my question for you: Do gammon and the classic game backgammon have a common linguistic ancestry? I’m really curious, let me know!